The city of Yeoksam in South Korea is a fast-paced urban hub peppered with towering buildings and contemporary apartments. And today, we will get the chance to witness the laudable makeover of a terribly messy and uninspiring flat. It was initially a drab place with stuff cluttering every nook and corner possible. There was a total lack of organization, which made the overall look of the apartment uninviting. But the interior designers and decorators at Homelatte took up the challenge of converting this home into a neat, practical and aesthetically pleasing nest. Now take a closer look at the magical change. 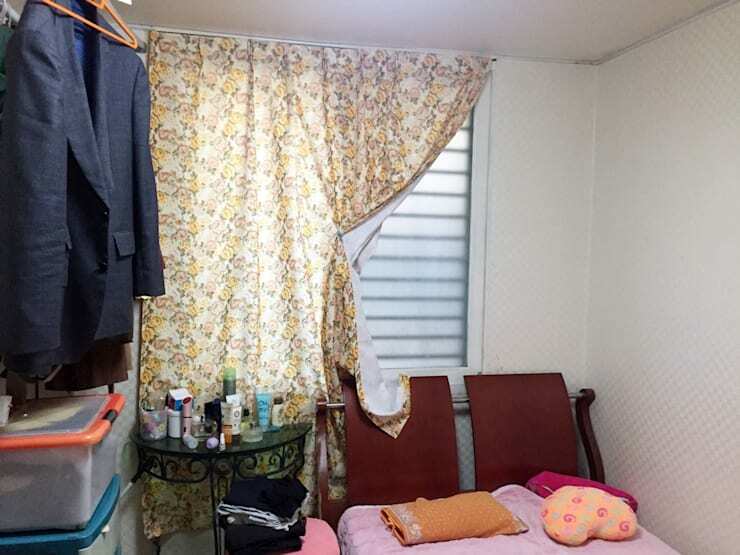 Before: Is it really a bedroom? We couldn’t believe that this was the bedroom of a little girl, prior to the revamp. The bed itself looked lousy, with a side table that took up a lot of space. 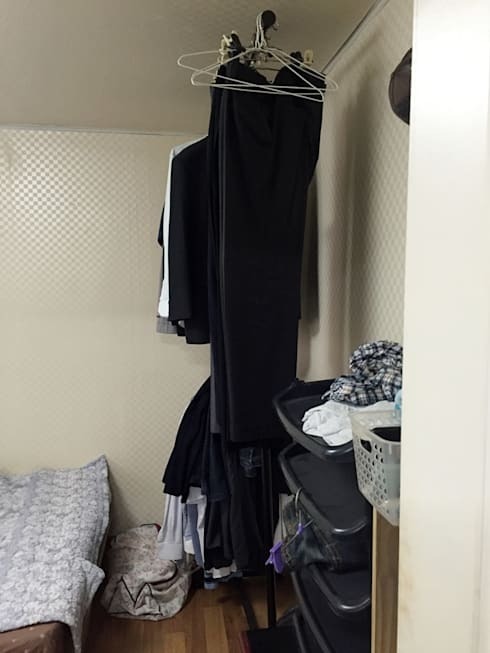 Plastic boxes were piled in a corner, and clothes were hung or strewn everywhere. The busy floral curtain simply added to the messy state of affairs and the overall look hardly promised any relaxation. When clothes litter every nook and cranny of a house, the visual impact they create is jarring and unwelcoming. And things couldn’t get any shabbier in this apartment, with a lack of proper storage system. After: Wow! 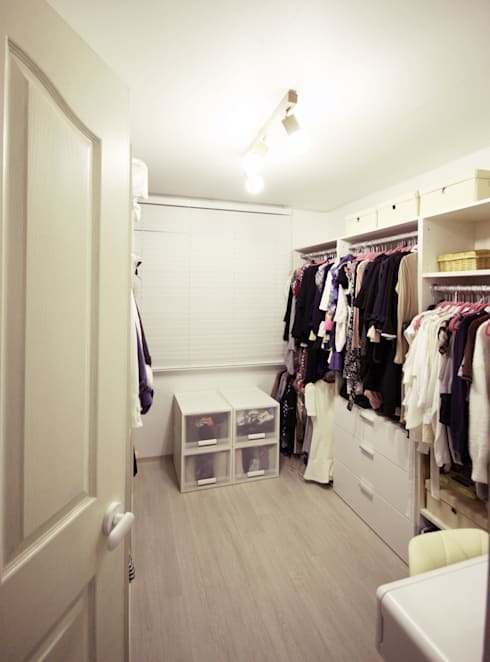 A walk-in closet! Fortunately, the designers discovered enough space to come up with a walk-in closet for the household, and fitted it with adequate shelves, drawers and cabinets. Equipped with a bright light and with fresh white paint on the walls, this storage room now looks smart, tidy and welcoming. A family can organize all their clothes, shoes, bags and accessories in here, easily. After: What a cute bedroom! The bed is a larger and comfier one now, with pretty pinstriped bedding, and is accompanied by a matching, compact plush couch on the side. Cozy pillows and cushions add to the snugness of the setting, which ensures that the child gets a good night’s sleep. Slim wall-mounted shelves come in handy for holding toys, knickknacks, books and such, while a soft rug adds warmth to the room. A powerful ceiling light bathes the space with brightness, while a quaint blue bedside lamp offers task lighting. Note that the boring wallpaper has been removed, and now a couple of quirky artworks lend fun and pizzazz to the bedroom. The television is mounted on a sleek cabinet which is accompanied by a practical and compact storage unit on the side. The hue of these furniture contrasts the predominant whiteness of the room nicely, besides proving their utility value by holding books, toys, videos and more. 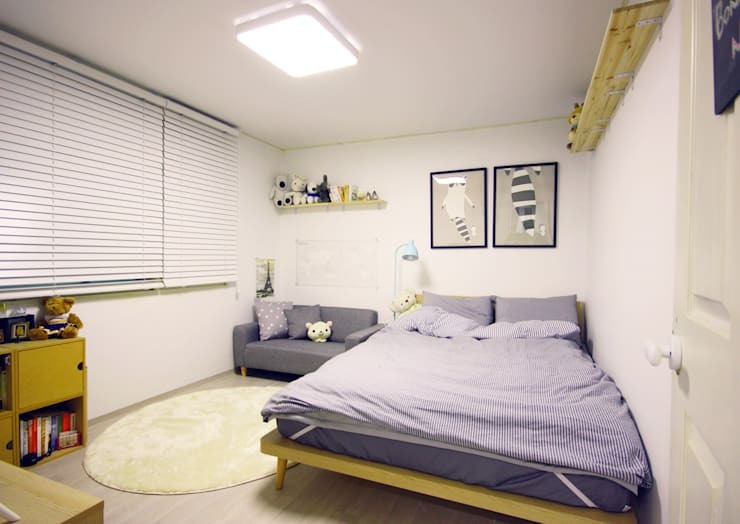 The simple but intelligent makeover of this South Korean apartment shows that you don’t need to break the bank to transform a space. A change of wall paint, removal of clutter, addition of modern and sensible storage solutions and contemporary touches of aesthetics can liven up a drab and gloomy place within seconds. Here is another story that you might find inspiring - Shabby to Chic: A Stunning Makeover Story from Switzerland.